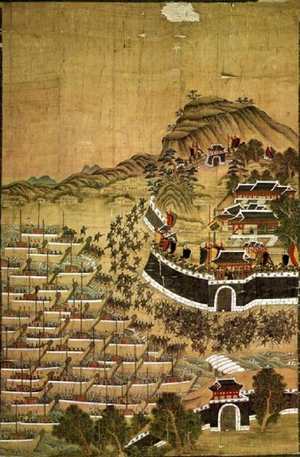 Difference between revisions of "Anapan-Yachiroese War"
The Anapan-Yachiroese War (Yachiroese: Ô Yûnúnepá iyàri Yûyàcharo Charù) was a war between the Kingdom of Anapa, located in modern day Letzia, and the Kingdom of Yachiro, located in modern day Yachiro. The war was started over Lestzi desires for Yachiroese ports, and prospects of expansion into Qonklese territory. Yachiro had become isolated in X, locking itself from the outside world. Any foreigner who stepped on Yachiro's shores would be put to death, with an exception made for Qonklese Government Officials, and later trade ships from Qonklaks. This period of Yachiroese history is known as the Sêsmú chî ("Years of peace"), in which a series of kings ruled over the Kingdom of Yachiro in relative tranquility. This period of tranquility and stability however, would not last long. With the turn to the 18th century, Ekuosian powers such as the Terminian Empire seeking dominance in Soltenna. This lead Yachiro to become even more vigilant in its isolation, even firing warning shots at foreign traders. The Treaty of Apinzy (Apínsûtmú Chîyexùchíŋ) formally ended the Anapan-Yachiroese War, and was signed by delegates from both nations. The treaty brought Yachiro out from isolation, opening the country for traders and allowing foreigners to stay and live in Yachiro. As well as this, it also ceded control of several port cities in the southern and western coast of Yachiro to Anapa. The treaty humiliated the Yachiroese people and their government's inability to deal with outsiders encroaching on Yachiro's territory. The ports of X would remain in Lestzi hands until the end of the Great Ekuosian War, when foreign pressure forced Letzia to return the cities. This page was last modified on 10 February 2019, at 01:59.